Alkmaar is a city in the province of North Holland. It is also a municipality that includes the areas of Koedijk, Alkmaar, Omval, Oudorp, Overdie, De Rijp en Oterleek. These areas used to be separate towns and villages but in the 70’s they were all brought under the municipality. Alkmaar city has a population of around 100,000, and is about 40 kilometres from the capital of Amsterdam. One of the polders by Alkmaar is a UNESCO World Heritage Site. The earliest known reference to the town was recorded in the 900’s. The little village grew and became wealthier through trade and agriculture, and in 1254 it was eventually granted a charter to become a city. The city was always in a slightly precarious place, being only a few feet above the sea, although it was protected by a line of sand dunes. It was also considered to be a very important place from a defensive point of view against the West Frisian’s whose lands were close by. The city continued to trade and prosper over the centuries. 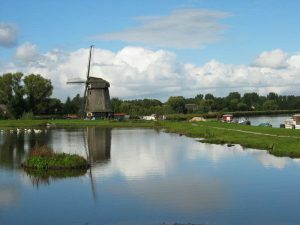 In the early to mid 1500’s a lake near to the city was the first lake to ever be reclaimed by having its water pumped dry by windmills. In 1573, in the Dutch rebellion against the rule of Spain, Alkmaar was put under siege by the Spanish. But Alkmaar stood against the army and refused to surrender and ultimately the battle was won with the failure of the siege. This victory was considered as an important battle in the eventual breaking free from the rule of Spain. During these times Alkmaar grew into a very important market for all of the produce of the surrounding areas and became the biggest city in the north of the Netherlands. And the market that still runs in the city is a remnant of this. It was during the 1600’s that the street map of the old town was brought into being, although much of the cities building were lost in the renovations of the 19th and 20th century. At the turn of the 19th century the city was briefly held by a combination of Russian and English forces, although they were eventually beaten in battle. In the early 1800’s the city was given a boost to its trade when the North Holland Canal was dug. and in the later part of the century the city was opened up to even more trade, by the arrival of the railways from Haarlem and Den Helder . In the 20th century Alkmaar expanded into the city and municipality that it is now, with the expansion of both residential and industrial areas, Alkmaar absorbed the nearby towns and villages to reach the size that it is today. Alkmaar is well served by the Dutch transport network and you should have no problem in completing you journey to the municipality. You can get good, high speed trains from Amsterdam in about 40mins, you can also get good connections from the train station at Schiphol Airport, which has arrivals from all over Europe and the rest of the world. There are also trains from Rotterdam, The Hague, Haaremand and Breda, Nijmegen, Maastrichtand andUtrecht. 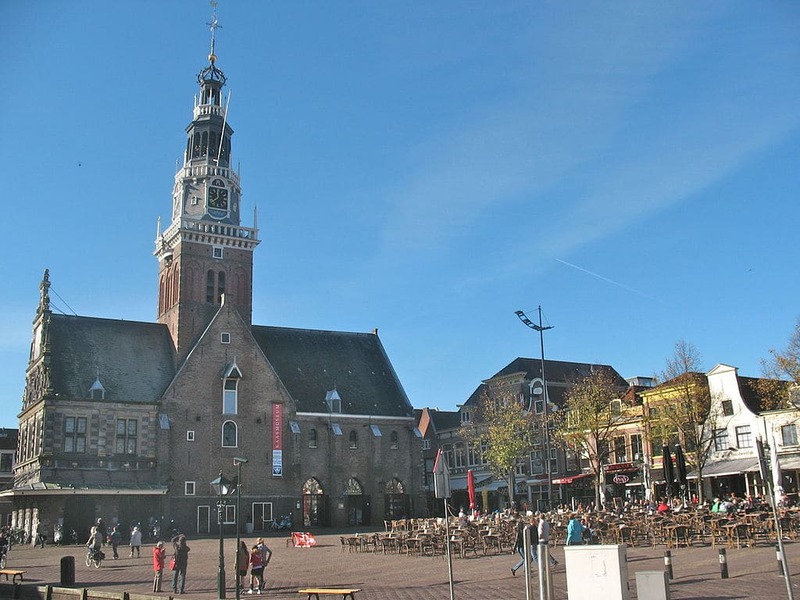 There is a bus service every hour from Harlingen that connects with the train from Leeuwarden, this makes a considerable time saving from the full railway journey. Alkmaar has an excellent bus service both to the local surrounding areas up to about 30km away and also in the city itself. It is easy to get to all parts of the city by bus and the bus station where you are able to buy the chipcaart for paying your bus fare, is conveniently situated right next to the train station. If you are arriving by air to Schiphol and would like to travel by car, there are many car hire agents in the terminal. When you leave the airport you should look for the signs to the A9 motorway, this will take you all the way to Alkmaar. But it is worth noting that the city can get quite busy with traffic and this might not be the best way of getting around. There are parking places around the city but they are very costly. Probably one of the best ways to get around the city is to do like the locals do and go by bicycle. there are good cycle lanes and they are fairly cheap to hire. If you would rather travel by taxi, you can find them on taxi ranks at the station and around the city. If you would rather book one by phone, then you can ring, Taxi 072, at, 31 6 46224277 , or, Taxi HB, 31 6 57544552. Alkmaar is a great city to visit for a short break, or a longer holiday. If you are interested in architecture then you will be in for a great time. But there are also interesting museums, market squares, tree lined avenues and some great canal walks. There is only one windmill still in the old town, there used to be ten just on the town walls, but the Piet windmill (it is the Piet family that own and operate it), is the last one left, but it still makes for a fascinating visit. The Stedelijk Museum Alkmaar is a very interesting museum covering the history of the local region. There are also sections that tell the story of the more recent history of the city. It also has some beautiful paintings from the 1500’s and the 1600’s. 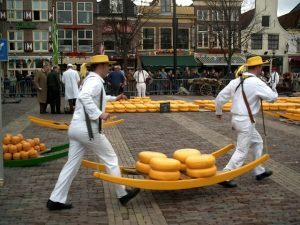 The market square in Alkmaar is a fascinating place which also houses the cheese market every Friday morning (Between april and september). Although these days it is just for tourists. One of the most picturesque buildings in the city is the Weighing House. This interesting building also houses the Cheese Museum. North of the square is the National Beer Museum where you can get a very interesting insight into the world of beer making which was so important in the medieval world. The building that houses the museum was built in the 1600’s. The Bistro De 13 Balcken is a really good restaurant that is a few minutes away from the main square. It can get very busy, so it is a good idea to book in advance. Serves good food from a short but well thought out menu and has cheerful and friendly staff. The Ristobar Italica serves high quality Italian food and concentrates on using only the freshest local produce. Good food with very attentive staff. Alkmaar is a great place to visit and you will never be short of an interesting view, a fascinating museum , or a good meal.